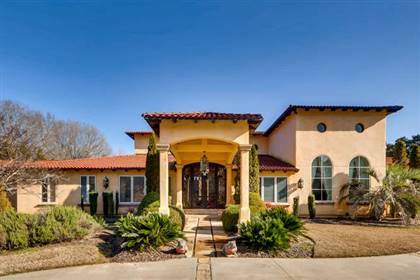 Private Mediterranean Estate sitting on 2+ acre lot in prime location in Atlanta Georgia. Main level walks out to luxurious outdoor living area which includes multi-level heated pool, jacuzzi, covered fireplace, outdoor kitchen and expansive private back yard. Master suit on main level with his and hers bathroom. 7 bedrooms, separate two bedroom apartment above the garage, and a 1 bedroom pool house. Pool House has a full kitchen and bathroom. Apartment is 1500 sq ft with full kitchen. House is 13,284 sq ft. The main house has an upstairs with two bedrooms. Large open entertainment spaces throughout the home. Very large, private backyard.